In Keynote, Preview and other applications text (and thus Chords and Scales neck diagrams) is inserted in floating and movable text boxes which can be placed and arranged anywhere on a page. In Pages word processing documents you can choose whether you insert neck diagrams inline as regular text or in floating movable text boxes. 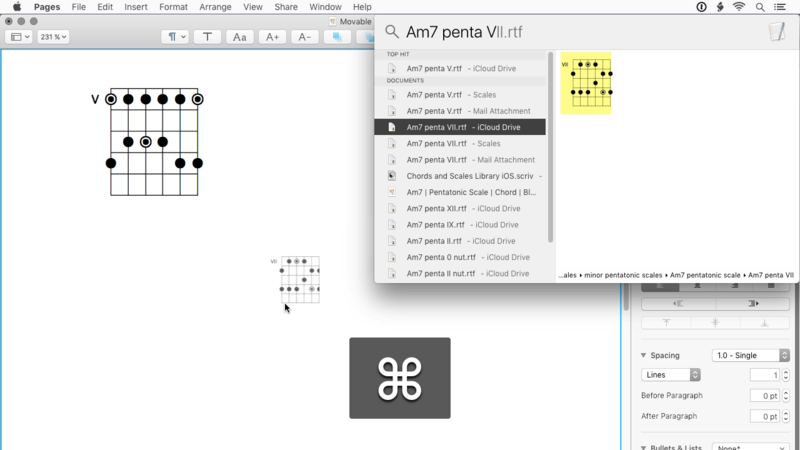 As already specified Spotlight Search offers a quick and easy way to insert chord-, scale- and arpeggio diagrams into your documents. As you type Spotlight builds a list of every match it can find by tracking the keywords, descriptions and tags applied to the Chords and Scales snippets. Choose Am7 penta V.rtf and drag and drop it into an open Pages Word Processing document. To insert a floating textbox with a movable neck diagram hold the Cmd-key while you drag and drop. Choose Arrange > Text Wrap > None to deactivate wrapping text around the floating textbox and place the diagram anywhere on the page.